Can you live on £1 a day? Starting today, thousands of people across the world are living on the equivalent of £1 per day for five days to raise awareness of global poverty for the Live Below The Line campaign. Essentially this means buying enough food for fifteen meals with just £5. To most people, this challenge is nigh on impossible, but the experiences of those who participate shed light on what it's really like to live in poverty. Live Below The Line challenges individuals and groups to live on the equivalent of £1 per person for food each day so they may feel the direct experience of the 1.4 billion people who live in extreme poverty. We're passionate about equipping people to make a real difference in fighting poverty, and so we focus on connecting people up to the organisations and issues that have the biggest impact. We run Live Below the Line because we think that to really fight poverty, we've got to try to understand it - and what better way than by spending just a few days below the poverty line. In 2013, Live Below the Line is running in the UK, Canada, Australia and the USA simultaneously, with more than 20,000 people spending 5 days living below the line including celebrity participants Hugh Jackman and Ben Affleck. I discovered the campaign (albeit belatedly) via Jack Monroe, a blogger famed for her £10 a week food recipes which she devised to feed both herself and her young boy through months of living well below the line right here in the UK. 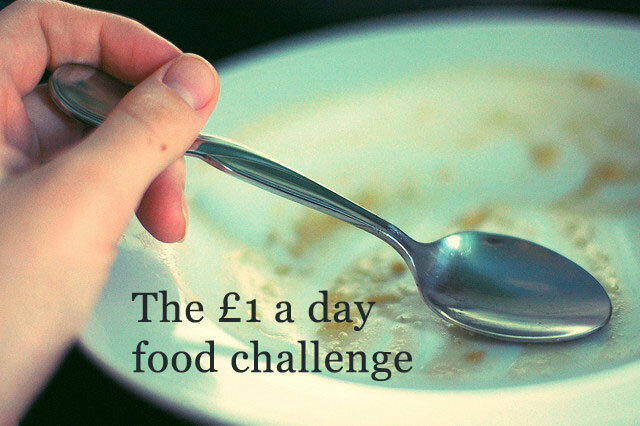 Although used to living on a consistently low food budget, Ms. Monroe will be taking part in the challenge too, making it even more difficult by "getting back to basics" and not allowing use of any growing herbs or store cupboard stocks during her five day challenge. What can we buy (and eat) with just £5? The Global Poverty Project has produced a guide for the challenge which includes sample shopping lists and recipe plans for single people. Whilst one of the sample weeks includes a pack of 99p sausages, these plans generally don't include any meat since a pack of meat could cost most (if not all) of the allowance for the whole five days! Here's an example of a five day shopping/recipe plan. Though no specific supermarket is mentioned, I'd guess all ingredients are sourced from the Basics range at Sainsbury's. As you can see, the menu is repetitive, unappetising and barely offers enough nutrition to fuel a person through the day. I had approached the week not really having thought about the cost of food, or even the amount of food we consume on a daily basis. I even made an unconscious mistake early in the week when I put butter on toast without accounting for the price. It was a reminder of how little I equate food with cost, and a reminder one of my work colleague’s didn’t let me forget as I added 10p onto my total. The week was surprisingly hard, more so than I had prepared for, as my energy began to wane and I felt constantly tired. Poverty hits children the hardest as it fuels a situation that is detrimental to a child’s development – imagine trying to concentrate in school when you haven’t eaten all day. Although it may be a little late to take the challenge this year, but you can still help by raising awareness of Live Below The Line or by contributing to one of the thousands of participants. For health reasons, I won't personally be taking part in the challenge this year, though I am supporting others who have chosen to take part and hope to help raise awareness through this post and other social media outlets. Are you participating in the Live Below the Line challenge this year? What are your thoughts on the sample menu and the possibility of living on just £5 for five days' worth of food? Please feel free to add your experiences and commentary below.